Make a colorful and bold statement by adding this attractive bar stool from Porch & Den to your home. This contemporary bar stool is adjustable so you can sit at your preferred height. It features a chrome base and is available in a number of different colors to match your personal style. This stool stands out with a comfortable bucket seat and stylish line-stitched upholstery. Click here for information on stool and table heights. Really pretty rolled and pleated seats, mine are white. Seats are really comfortable, but no back support. If you don’t sit up straight, you will slide down a little bit. Not crazy about the zipper on the back. I guess they needed to have it to get the cover on. So easy to put together, 4 screws with an Allen wrench. One other thing, when you sit they go down about an inch, if you swivel to get up, the back will get caught under your island or counter because they pop back up an inch. These adjustable bar stools arrived when they said. They do need to be assembled, but it takes maybe 5 minutes to put one together - if you follow the directions! They are comfortable for sitting, but for some, the back is not high enough or close enough to be able to lean back comfortably. (I am short and cannot lean back in them.) I use a small pillow for lumbar support. The back of the stool is about 9 1/2 inches high. The adjustable height is great; the swivel is great. Overall, these are very good stools. Just know that some people will not be able to lean back comfortably. Bought for my son's room. 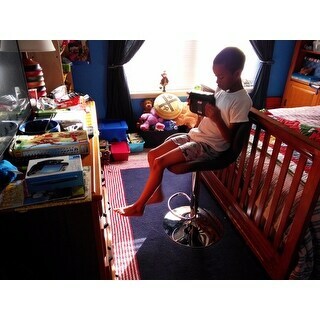 I wanted an adjustable chair so that he could sit up high and play his video games. It really is cute. I love the padding. I wanted comfort for him as well. So it's not just a bar stool. In my son's case it's a gaming chair. I have 2 fractures in my spine and have a hard time standing in the kitchen to cook but this stool is wonderful it supports my back and adjustable height its great! Good quality, nice product. Needed chairs for a new island in my home. They needed to be of a leather like material, adjustable heights and a darken gray color to match decor. I was very impressed with my purchase due to all the requirements I had. But the lower backing really impressed me due to back problems and recent surgeries, they were very sturdy and comfortable to sit in. Thank you for such a great product. These stools are perfect with our bar. They offer comfort and support for your back. The red really pops next to our dark espresso bar. Love the adjustable heights. These are so neat! Nice leather finish, with solid base. I love the bucket seat, and the adjustable height. Perfect size for my kitchen counter window/bar. I got these in fabric gray and they are just perfect for what I need. The adjustable height and swivel is great, and the seat is comfortably wide. They look wonderful at my breakfast bar! I admittedly didn't do a lot of research and just bought these because they were on sale and a great price. The other metal and wood bar stools look cool, but I knew after sitting in it for a while I'd be uncomfortable so I wanted something that at least looked like it was comfy. I must say I'm very pleased with these stools! They were super simple to put together and I'm amazed how comfortable they are. Highly recommend! Very good quality. Very easy to assemble (if you read the instructions) I like the low profile yet it provides just enough back support for comfort. They're easy to adjust for different counter heights. I ordered this barstool in red. The color was bright and I loved it. The design was modern and perfect for my kitchen. Unfortunately, when I sat on it the back was too low to offer enough support, and I'm only 5'2". I purchased these so I would have a place to sit when using my long arm quilting machine. They adjust to just the right height and allow me to do intricate work without killing my back. I had no problem assembling them myself and they are reasonable comfortable. I like the style, they're comfortable and look more expensive than they were. Easy to assemble. They look sharp. Smooth height adjustment. Great product shipped as per requested. Easy to put together. I ordered blue, it's very comfortable and I can move it up and down depending on what I'm working on. Very sturdy and looks great. I love it. Would recommend it. These chairs are very cute. They are also super comfortable. I much prefer these than the hard modern chairs. The padding makes it comfortable. Overall, I am very satisfied with this product. 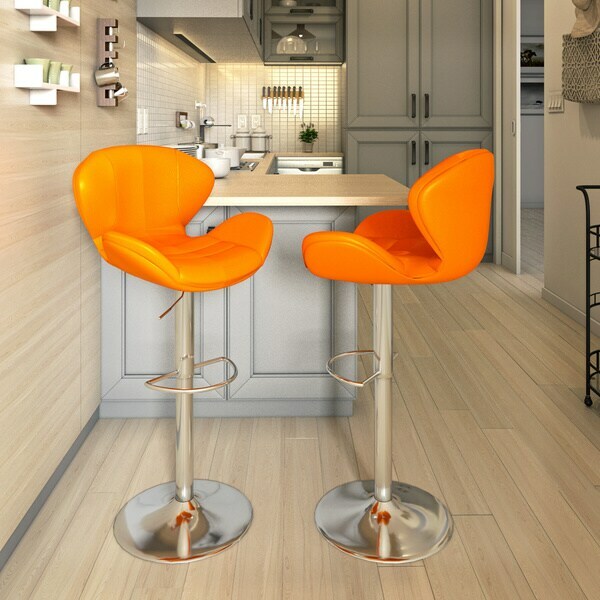 The reviews that I read were true and that you really have to be careful not to get the seat or the top of the chair caught under the island because it can caused a little rough spot on the trim of the seat. We bought them in white and they looked really good! At first I wasn't sure the quality as good as in the picture but when I got them they were great and they add a very contemporary look to our open space kitchen. "How do you raise or lower the stool? It says adjustable but because the directions are sparse I have no idea how to adjust the height." to lower sit on it the move handle they will lower. if you are not sitting on them they will rise when you move handle. There is a lever on the side that works like a hydraulic lift to raise and lower the stool. "why is the brown faux leather more than the orange or black faux leather?" "Will the white stools be back in stock?" "What is the difference in the color “black” and “black fab”? 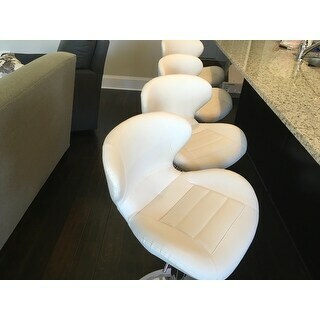 I was not able to locate this in description or questions re: stools? Thnx!" The black is made of black fabric. The black fab is cloth and black is vegan leather. 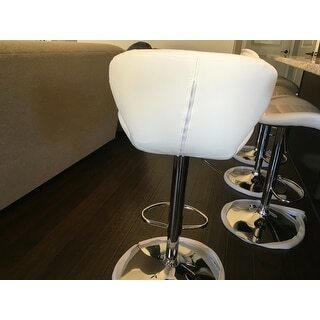 "Do you need pads underneath if going on hard wood floor"
These bar stools do have a rubbery bottom on them but you may want to add your own for more support. 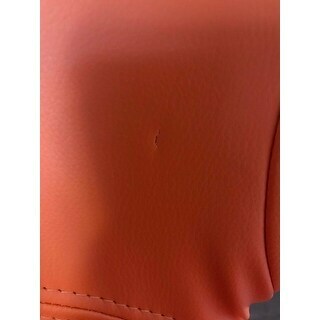 "is the black a leather/ leatherite. There seems to be a black and Black fabric." "is the black fabric more like dark grey or charcoal grey?"